The study of string instruments should include ensemble playing at the earliest possible stage. There is much to be gained from the playing of duets. Each player learns how to listen to the other, and in a short time develops an awareness of balance, musical phrasing, intonation, and tone quality. This type of training is excellent preparation for participation in large groups. 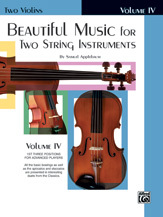 These four volumes of duets for two violins will help fill the need for early ensemble experience in the public schools. They should be used in string classes as a supplement to any of the standard string methods. They will also encourage music making outside of the school, with parents or with other students. These duets are ideal for recitals in the public schools and in public school festivals. They may be played by two performers, or by multiple performers on each part, with or without piano accompaniment.